Sunday withdrawn between Mitcham and West Croydon. Withdrawn between Mitcham and West Croydon but extended from Scrubs Lane to Willesden Junction to partly compensate for loss of Route 268. Withdrawn between Tooting and Mitcham. Withdrawn between Willesden Junction and Park Royal Stadium. Shepherds Bush (S) allocation converted to Metrobus operation. 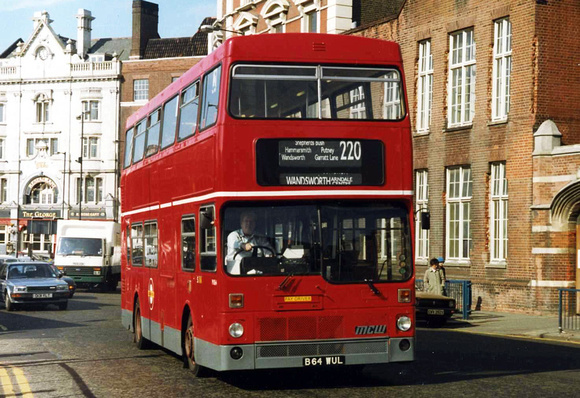 Wandsworth (WD) allocation converted to Metrobus operation. 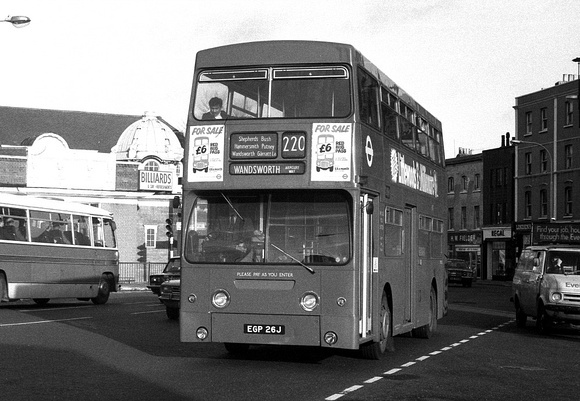 Withdrawn between Wandsworth and Tooting - replaced by Route 270 Putney Bridge Stn and Mitcham. Sunday allocation transferred to Wood Lane base (B) and converted to midibus operation. Sunday allocation transferred back to Shepherds Bush (S) with the closure of Wood Lane base (B). Converted to low floor double deck operation. Date running number sequence changed unknown ?